Today's post is about the nails I did on Saturday. Ali has been enjoying her themed nails recently that I have also posted about recently. This time she had her heart set on an Avengers theme as they are her boyfriend's favourite characters. Since Shellac is so hard wearing I wanted to find a way to make each character work as a Shellac colour. I'll go over what I used for each one. I used Black Pool all over the nail, applied CND Additive in Deep Blue on top and used Wild Fire and Silver Chrome for the web. For him I used Red Baroness, Iced Cappuccino, Cream Puff and a little Azure Wish to create the glow around the eyes. Just like Spider-Man I used Black Pool and CND Additive in Deep Blue along with Silver Chrome, Rubble and Cream Puff. He was more of a challenge as I needed to get that brighter green shade so I used Cream Puff and then applied Limeade and then used the CND Additive in Medium Green to achieve it along with Rock Royalty for his shorts. Just like Thor and Spider-Man I used Black Pool and CND Additive in Deep Blue and then Cream Puff and Wild Fire. 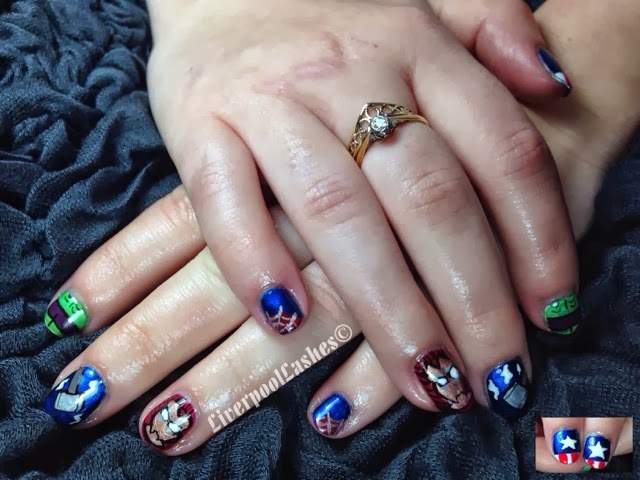 I'm pleased with how they turned out, Iron Man was tricky but thankfully everyone who has saw her nails has recognised him straight away so I'll presume that they look okay!! These look amazinggg! you are soo talented!